I was recently horrified to discover that the anti-Islam extremist, Anne Marie Waters, is considered one of the front-runners to be Labour’s candidate for Brighton Pavilion, for the next general election. Indeed, because alongside her bigoted anti-religious views she is also a pro-NHS campaigner, there is a danger that the left and some unions may support her for the Labour candidacy. I first came across Anne Marie Waters when she put herself forwards for the South Swindon selection, and very unusually for a Labour politician Waters gave as her personal reference a Central Committee member of the Worker Communist Party of Iran, Maryam Namazie. It was also very difficult to get a straight answer from Ms Waters what she actually does for a living, and how it is funded. Both Namazie and Anne Marie Waters signed a letter in 2010 to the Guardian opposing the state visit of His Holiness Pope Benedict XVI to the UK. In February 2013 Anne Marie Waters appeared in a short Channel 4 film, where she made alarmist, ill-informed and dangerous remarks about immigration – view it here. Anne Marie Waters self-describes herself in the film as “an anti-Sharia campaigner”, and says that Islam is a religion that, in her words, is “new to Europe”, and that she “is frightened of”. In the film she makes it clear that she thinks that religiously observant Muslims should leave the UK. 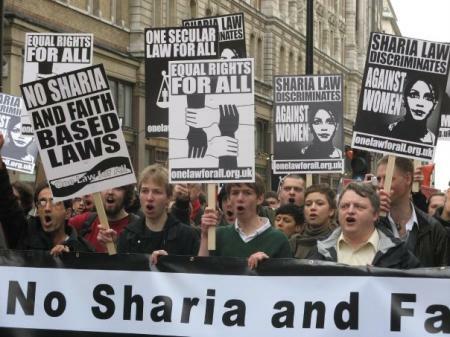 The campaign that Waters is co-director of, One Law for All, wants to see Sharia law outlawed in the UK, as Anne Marie Waters makes clear in this article from February 2013. Her arguments for it are completely inflammatory, implying that the most extremist views of some Muslims characterise all who hold that faith. It is clear from this article that the views of Anne Marie Waters are as ignorant and extreme as those of “Tommy Robinson” of the EDL. Bizarrely, Waters knows very little about the subject she has devoted her life to. She seems to believe that Female Genital Mutilation is a practice deriving from Islam, when it is actually a cultural practice dating back some millennia, and practised in a wide arc across North Africa, by people of many different religions, including Christianity. It is in any event already illegal in the UK, and all that is needed is for the current law to be enforced. She seems to believe that women are coerced into using Sharia courts, but actually for someone who – for example – wants to remarry within her own religious community, getting an Islamic divorce may be a prerequisite. I discussed this question in this article from 2008, in response to very cogently argued remarks by Dr Rowan Williams. To outlaw the exercise of religious authority within a faith community would be tantamount to a state ban on organised religions. We must recognise that people who choose to self-identify with a religious community, and its associated laws and ethics have a right to do so. The actual, and so far relatively successful, experience of multi-culturalism and convergence towards consensual liberal values in British society has not been on the basis of any campaign for secularism, but has succeeded by offering choice and empowerment. 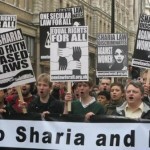 The issue here is not only that the views of the One Law for All campaign are dangerous in a society experiencing a rising tide of Islamophobia and intolerance – giving a cod-leftist gloss to the rantings of the ‘counter-Jihad’ movement and the street thugs of the EDL – but that someone who defines their main political priority as being an “anti-Sharia” campaigner and promotes extremist intolerance against not only Islam but all religions, and who also uses dog whistle comments opposing immigration, is a very unsuitable person to be a Labour candidate for parliament. There is no doubt that any election campaign, especially one for Westminster, that Anne Marie Waters was involved with would be dragged into distracting controversy, and she would be actively opposed by immigrant communities and faith groups, thus alienating a wide swathe of Labour voters. Posted in: CLPD, Migration/Immigration, Race/Racism, Westminster. The fact is that, although I am a committed Labour activist, I think it would be a disaster if Caroline Lucas was not to be returned as MP for Brighton Pavilion. She is an outstanding MP. Her politics are very sound on almost every issue of concern to socialists. I suspect that Ed Miliband feels likewise. Or her view on new air ports , the new London bridge? Even if she is selected she’s not the candidate to beat Lucas. Waters would most likely ensure the re-election of Lucas and lead to widening support for the GP elsewhere. Congratulations to Left Futures on exposing this secularist entryist to Labour. We need candidates who can speak from a position of grounded faith and principles – be that faith Christian, Muslim or any other – rather than careerists who believe in nothing. This is even true in Brighton despite the relatively large non-faith population – there is no benefit for us in trying to out-atheist the likes of Caroline Lucas or Nick Clegg. You have been attacked for this on Harry’s Place, so you are obviously doing something right. Have you thought of putting in for Brighton Pavilion? “Secularist entrist”, Philip? I’ve never thought of secularism as somehow alien to the Labour Party; indeed, many people of faith within it uphold the need for secularity as the only basis for multiculturalism. I have no idea whether or not Ms Waters is the best candidate for Brighton Pavilion. That is down to the local party. But to describe her as ‘the worst possible candidate’ seems to overstate the matter somewhat. Actually she sounds like exactly the kind of candidate Labour needs. We need more atheists openly combating the re-emergence of religion in politics. Andy Newman conveniently forgets she also condemns Christian Fundamentalists. Exactly what is wrong with demanding equality for everyone before the law? Mr Newman should rejoin Respect, he’s not a Labour man. The strike action continues against the supposedly left-wing Green council in Brighton and Hove. Refuse collectors’ wages are being cut by £4,000, despite a £4.2 million underspend. The money is being diverted to the Greens’ hobbyhorses such as “One Planet Living”. Local residents now compare Brighton to a landfill site, and scarcely contain themselves as they wait to kick out the Greens. And not only at municipal level. But that is where the Brighton Pavilion Constituency Labour Party is in danger of dropping the ball. Ms Waters is a leading light in the use of supposed fear of Islamisation in order to pursue longstanding militant atheist attempts to outlaw, for example, religious marriage tribunals from meeting purely in order to rule as to whether or not those who had voluntarily approached them might be married with the desired religious rituals. Muslims are not the only people who have those. Jews would be just as much a target. And the real targets are Christians. There are very strong arguments against Islamisation. Ms Waters does not and cannot make them. No wonder, then, that her website links to that of the National Secular Society, which campaigns against immigration by Polish Catholics because they are Catholics and by West African Pentecostals because they are Pentecostals. There are very strong arguments against mass immigration. Ms Waters does not and cannot make them. So what, you may say? It is not as if she is trying to be selected at Durham North West, where, since the demolition of the old Consett Civic Centre, the Constituency Labour Party meetings are held nearby in the self-explanatory Saint Patrick’s Church Hall. Yes, she would be impossible anywhere in Scotland or the North of England. Yes, she would be impossible in many or most constituencies in Wales or the Midlands. Yes, she would be impossible in a sizeable and growing number of constituencies in London. But she is not trying her luck at any of those, is she? True enough. But the Greens would have been desperate to hold on to their only seat even before recent events, and will be even more so now. They fought hard to win it, and they are going to fight hard to keep it. Anything would be used. Anything at all. And what if Ms Waters got in? She would be the Whips’ nightmare, using her once-countercultural South Coast base to wreak havoc for the party alike across Scottish, Northern. Welsh, Midland and London heartlands, and across those key target areas which may in many cases be close to Brighton geographically, but which most certainly are not so in any other way. If Brighton really is quite like that, and some of us have our doubts, then it can always vote Green. For what must at least be the large never-countercultural population there, the ongoing events throw into sharp relief the imperative of voting Labour. Provided that Labour gives that population anyone to vote for. It depends upon whether you see Labour as a party that aspires to government, or as a party which peddles you own pet projects. There is no prospect that a militantly anti-religious party could win a general election. With regard to your ridiculous implication that the Labour Party is a traditionally secularist and militantly atheist party, this would be news to Keir Hardy or RH Tawney. … And what if Ms Waters got in? She would be the Whips’ nightmare, using her once-countercultural South Coast base to wreak havoc for the party alike across Scottish, Northern. Welsh, Midland and London heartlands, and across those key target areas which may in many cases be close to Brighton geographically, but which most certainly are not so in any other way. Quite so; what is interesting about Ms Waters is that campaigning against Islam is not an peripheral quirk, a quick google search shows that she does it at least semi-professionally. To prosper as a coalitional election winning party it is essential that Labour does not have MPs working to deliberately attack and undermine a key part of the party’s electoral base. No one, myself included is suggesting Labour should become a “militant anti-religious party” and I am aware of Labour’s tradition of “owing more to Methodism than Marxism”, but that’s not the point. The growth of religious influence in British politics does need to be balanced. There is a dire need for everyone, especially women from ethnic minorities and in particular the Muslim community to realise that they have EQUAL rights in this country. The apologists for conservative reaction like Andy are part of the problem, especially when he infers that my views are part of a “pet project”, which really sounds like “pots & kettles” if you read the Socialist Unity website. Andy’s outdated and somewhat Stalinist outlook of the world has no place in the modern Labour movement. What we need is a progressive movement that breaks with the failed ideas of long dead Russians. The world has changed, but the left is being literally left behind. Hardly apologism, I take a view that convergence towards a liberal consensus is best acheived by empowerment and choice. Andy’s outdated and somewhat Stalinist outlook of the world has no place in the modern Labour movement. Ridiculous. As the starting point of my politics is the necessity for social democracy to adapt to the modern world where China is the growing superpower, and the left needs to leverage state sovereignty to acheive win-win outcomes with Multi-national capital then I would argee that my politics are profoundly located in the present. I also believe that the best of the English philosophical and political tradition is to embrace pluralism and that this tradition of multi-cultural accomodation is much superior to militantly telling individuals and communities what to think. Some Stalinism! What we need is a progressive movement that breaks with the failed ideas of long dead Russians. And which “dead Russians” am either I or Socialist Unity website aligned with? I think I have written more articles about RH Tawney than i have about any Russian! I’m not sure I could even think of a Russian politician, alive or dead, who I particularly admire. You need to give your own prejudives and pre-conceptions a rest I think. You do realise that Howard and David L were arguing opposing things? Andy; I read your article about the venerable Archbishop when it was published and was as appalled by your take as his original comments. You really have a prejudice against secularism which for a “socialist” I find surprising, but does fit in the far from liberal agenda that is set by Socialist Unity. It was your current witch-hunt (lets call it for what it is) against Anne Marie Waters whose campaign for women’s rights within the Muslim community started this debate, so please refrain from telling me to “give it a rest” sir. I firmly believe in equal rights for women regardless of their religious background and the work done by One Law for All is something all of us should support. No one should be denied their equal rights in this country. Socialist Unity pursues a political line that is remarkably similar to George Galloway. You support Assad, have a soft attitude to the clerical fascists who run Iran and your position on China is not as palatable as you try to make out. Democracy and equal rights must be for all regardless of cultural differences. Finally, because I am going to give this thread a rest I find it laughable that the Marxists of SU criticise anyone for “militantly enforcing their views”. For the record I seek open and rational discussion to debate and persuade, something the censorship policy pursued by one of your co-editors in particular (and picked up on Urban 75 for the record) would suggest you seek to do otherwise. I am not a liberal, I am a social democrat. YOur basic proposition here is that I am so extreme that I support the former Archbishop of Canterbury in his arguments about extending the Anglican tradition of pluralism and tolerance to a broader aceptance of religious diversity. In your view, agreeing with the most senior Anglican Archbishop is inconsistent with membership of the Labour Party! You might want to have a little think on that. This is disingenuous. Of course all of us believe in equal rights for women, but you also have to respect the rights of women to follow the religion of their choice. The “One Law for All” campaign seeks to deny choice to women, and to impose state restrictions on religious freedom. I believe in contrast that women need to be empowered to make their own choices, and the civil courts should exercise supervision and oversight of religious tribunals to ensure that consent is informed and genuine, and to ensure natural justice. Can you point to anything I have ever written anywhere that can back up your claim that I “support Assad”? With regard to Iran, my position has been entirely vindicated this week, that Iranians can sort out their own country, without outside interference. A contested election where the voters had a meaningful choice resulted in the election of a reform president. There is no reason to think that the undemocratic parts of Iran’s constitution cannot be removed in the future by constitutional means, in the same way that undemocratic parts of the British constitution have been challenged over the years. I look forwards to democratic reform in Iran by constitutional changes and debate, driven forwards by Iranian themselves. With regard to China. I would point out, for exmaple, that my view on Tibet is broadly the same as David Miliband’s. So what is “unpalatable” about acknowledging the success of China’s economic reforms, the achievment of lifting so many millions out of poverty, and acknowledging the broad progress towards rule of law. China has a specific political system that has arisen in its own particular historical situation overcoming colonialism and warlordism, and immense economic under-development. Have a little think about this. I exercise no position of authority , and I have merely offered my opinion about Anne Marie Waters politics, which other people can agree with or disagree with. I have invited scrutiny of her anti-Islam campiagning for a very good reason. When she tried for the South Swindon nomination, she did not mention her anti-Sharia campaigning, and I only discovred it when I googled her. I beleive that a militantly anti-religious candidate, and someone who self defines themselves as an “anti-sharia campiagner” would be a disastrous Labour PPC, because she would alienate a large part of Labour’s core voters; and were she elected as an MP, her preoccupation with militant secularism would be a really hot potato for the party. It is not a “witch-hunt” to democratically express a view about the politics of someone seeking elected office. blimey, if you adopt that attitude, then we might all end up being friendly and fraternal! You do know the rules of the Internet? When she’s not busy betraying her own party, and kicking it while it is down, it seems that Green MP Caroline Lucas is busy displaying spectacular ill-judgment elsewhere as well. It hasn’t occurred to Lucas that attacking her own party at their lowest ebb not only displays a casual betrayal and lack of integrity, but in publicly agreeing that the Greens are not worth supporting, Lucas forgets that she herself is a Green; I don’t think she has thought this through, but then I don’t think she has thought many other things through either. On Yusuf Al-Qaradawi (a prominent member of the Muslim Brotherhood which recently refused to support a campaign opposing violence against women), Lucas is alleged to have stated: “Al-Qaradawi has been the victim of an Islamophobic smear campaign in some sections of the media, and has been associated with a fundamentalist position on a number of topics, including the treatment of homosexuals and women. Most of the criticisms levelled at him have been ill-informed.” I’m afraid not Caroline, Al-Qaradawi is known as an anti-Semitic, homophobic misogynist because that is what he is. The man who describes suicide bombings as “martyrdom operations” has also said “throughout history, Allah has imposed upon the (Jews) people who would punish them for their corruption. The last punishment was carried out by Hitler. By means of all the things he did to them – even though they exaggerated this issue – he managed to put them in their place. This was divine punishment for them. Allah willing, the next time will be at the hands of the believers”. Yusuf Al-Qaradawi also supports female genital mutilation: “whoever finds it serving the interest of his daughters should do it, and I personally support this under the current circumstances in the modern world”. He is also somewhat vague about condemning domestic violence, which he describes as being not “obligatory nor desirable”. He thinks homosexuals should be punished with “the same punishment as any sexual pervert”. Yet he finds himself defended by Green MP Caroline Lucas, who once said that gay rights were the top of her agenda. Is that gay rights everywhere Caroline, or are you ok with the murder of gays by your beloved Islamists all over the world? Given all of this, it is not surprising that Lucas is also a supporter, according to Bindel, of boycotts on Israel. Not only does this put Israeli workers on the dole (but to be fair, the Greens have never been much cop for the working classes), it also completely and totally ignores the horrific crimes of Hamas who are slowly but surely turning Gaza in to a nightmare to rival Saudi Arabia and Iran. Hamas recently banned women from taking part in a marathon, and some Palestinian women’s rights campaigners have said that women in Gaza no longer bother to go to the police if they are beaten by their husbands because domestic violence is a “right” according to Hamas, who are applying strict sharia law and turning life in to a living hell. The Hamas constitution describes homosexuality as “an abomination” and supports the death penalty. But you won’t hear about this from Lucas or her fellow travellers who no doubt find it far too uncomfortable to acknowledge that the world is not quite as simple as “Israel=bad, Palestine=good”. I cannot put it better. Actually I wasn’t going to comment further but I’m glad Andy has published that article by Ms Waters. It’s about time some of the appeasers of clerical fascism were told what they do is wrong. For the record I thought it made some excellent points. Large sections of the “Left” have showed cowardice on confronting the issues she raises and have been like that since the burning of the “Satanic Verses” (crap book, but free speech is not negotiable). I doubt very much that this would form any major part of her election campaign. Its, Jobs. Pensions, conditions of service. cuts to services and getting rid of the Coalition Government that most potential Labour voters will be interested in. Which is why I’m surprised Andy and his blog are more interested in backing the discredited Green Party rather than backing Labour. The public sector workers in Brighton who have had their wages cut won’t have any sympathy with Caroline Lucas and her Green Party. If anything we should be putting pressure on Ms Lucas as the Greens have failed trade unionists badly. So what Andy’s real motives are certainly questionable. Personally I think Ms Waters would make an excellent MP. Labour needs free thinkers. Not something Socialist Unity is in favour of. The ideas promoted by Andy and his crew hardly seem to fit the ethos of Left Futures which promotes forward thinking. More like backwards to Beira. Andy Newman may be telling the truth (for a change) when he denies ever having expressed support for Assad. But Mr Newman’s ‘Socialist Unity’ sidekick John Wight (who Newman defends as a comrade and co-thinker) most certainly has, on several occasions over at ‘SU’. I must say that I do find it extraordinary that a former Marxist (now self-styled “social democrat”) is witch-hunting a Labour person on the grounds that she’s a militant secularist and supports “One Law For All”: both positions are rather fundamental to something called socialism in both its Marxian form and its vertebrate social democratic form. The British labour movement spent years driving religious communalism from its midst (especially in places like Liverpool and Glasgow) and now relativists and religious apologists like Newman seem determined to reintroduce it. I fully support the One Law for All campaign. If my desire to protect the hard fought for rights of women and gay people means I am called “Islamaphobic” then that is one cross I am more than willing to bear! It is not at all incompatible to be both a Labour supporter and a secularist. Am I right in my assumption that the writer of this piece is a heterosexual man? There is no other logical explanation! First of all have your facts right. I am one of the three women candidates for selection in Brighton. There is no Ex-Tory councillor that has put her name down for standing as MP for Brighton Pavilion constituency. So I don’t know who has been spreading around the rumour that I was ever a conservative Party councillor. I have never been a Tory councillor. The truth is I was very briefly a member of that party 23 yrs ago when I was new to politics. I didn’t agree with their views so I denounced their policies and I publicly resigned very soon afterwards and I’ve never rejoined or looked back to that party. Then I stood as an Independent woman candidate in 1986 in the largest ward at that time and raised many issues for all the constituents. I got about 400 votes which was quite a lot for an Independent woman candidate. I then denounced the Tory policies were not in the best interest of the people I wanted to represent, therefore I resigned publicly through the press. I have a wide range of experience from all walks of life. My child hood was among politicians and Union supporters and workers who were well qualified educated and knowledgeable in community issues and party politics and in representing members of the public. My father was an All India Railway Union board’s chairman. I have lived in England, London for the past 43 yrs. I joined the Labour party in 1994 and have campaigned vigorously from grass roots to all levels and during those years I’ve worked tirelessly representing the public and helping them with their issues and problems, without any pay. I have much more to offer Brighton’s constituents as a result of my extensive political experience, negotiating and debating skills and the strength of conviction to give the constituent’s of Brighton the changes for the better that they want, and give them the best representation they are longing for and that they so rightly need, in parliament.